For the past year, a new type of camera has been steadily growing on my photography radar. At first it was just a curiosity but more recently, my interest has seriously increased — enough so that I’ve started my research into this area. There is no official name for this class of camera but I like the term EVIL, which stands for Electronic Viewfinder, Interchangeable Lens. Some people call them mirror-less DSLRs. These cameras have interchangeable lens like DSLRs but they lack a moving mirror and many of them use an electronic viewfinder rather than an optical one. However, the key, exciting feature is that EVIL cameras take images at or near DSLR quality but with a significantly smaller and lighter body. In 2008, Panasonic was the first to ship this new type of camera. The Lumix DMC-G1, under the new micro four thirds standard that it developed with Olympus, did not get much attention from the press or from customers. Maybe it was because it looked like a conventional DSLR, albeit a small one. It wasn’t until Olympus introduced their retro-styled E-P1 in 2009 that people began to notice. Olympus did great nostalgic marketing to tie this new compact digital cameras to their PEN film cameras from 40 years ago. Now with Olympus’ success and notoriety, other manufactures have joined the crowed. I’ve heard some reports, unsubstantiated, that in Japan, these EVIL cameras are now accounting for up to 40% of the non-point and shoot market. Potentially a serious challenge to the long-established SLR camera trend. Why do I need an EVIL camera? That is a good question. One that I’m sure my wife would ask and I ask myself. I like to think that I’m a relatively frugal person so I don’t want to end up buying something that I don’t use quite a bit. This is why I’m starting my extensive research. For the bigger ticket items, I usually do a bunch of research — I enjoy weighing all the factors before making (hopefully) a good purchase. I have a smattering of older cameras but I actively use 2 cameras right now. My primary camera is my Canon 7D DSLR which I purchased back in March of this year. In the 7 months since its purchase, I’ve taken over 30,000 photos so it does get a lot of use. Its been a great camera and I like it now even more than when I first purchased it (you should have seen how much research I did before upgrading to this camera). My other camera is my Sony TX-5 water-proof point and shoot I bought in the summer. I have a review of the Sony TX-5 on this blog. As you can tell from the review, I’ve also been quite satisfied with this ultra-compact camera. Beyond its special water-proof capabilities, I carry it around all the time as my “shoot whatever is interesting in my life” type camera. So with two cameras, why do I need another one? I can think of several cases when a in-between camera will be very useful. When I’m taking pictures of the family at everyday events, at restaurants for example, I find that my Canon 7D can be, well, sort of big. I find that some of the casual spontaneity is lost when I have my big camera several feet away from my kid’s face. I noticed with my small Sony TX5, the kids seems more relaxed and playful. The device’s small size does not change the dynamics of the situation compared to a large DSLR with a large lens. Of course, the image quality of the point and shoot is not that great, especially in low light. I would either have to crank up the ISO or use the flash. Either way, on a point and shoot, it does not produce a photograph that a “serious” photographer will be proud of. Also, these small cameras tend to have a very deep depth of field that creates portraits with sharp backgrounds that may look distracting. I am hoping a mid-sized EVIL camera would reduce these issues. It would have high image quality while still being small enough not to get in the way. Video, while not my primary purpose, is still very important. The 7D is known for great video but it is a very big hassle to use for family movie snippets. It does not continuously auto-focus and its focus speed is very slow. If you are an indy film maker, this camera can be wonderful but it’s not easy to use like a camcorder. I also have a nice high-definition 1080p camcorder but found that I really don’t use it much. I am not excited by the feel of the images it produces — it’s too camcorder like. I prefer a more movie-like, cinematic feel with shallow depth of field. Still photography is my primary interest and I find the camcorder will always be a secondary device that gets in the way. Wouldn’t it be great to have one tool to take great still images and get high quality video clips? I’m hoping that an EVIL camera will be that one device. Its large sensor should also allow it have a deeper depth of field and nice low light capability that camcorders just don’t have. And finally, when I’m out taking my photographs with my 7D, this mid-size camera will allow me to carry a second, very portable body to take high quality images in a normal 27 – 85mm range. This way, I can have my ultra-wide landscape lens on my 7D and still take quick people shots without changing lenses. I can take my action soccer photos with my 70-200 lens but still shoot closeups of the kids with my EVIL camera, again without changing lenses on my 7D. Sounds like a plan. Do you think this is enough of a justification? I’ve worked hard at thinking of valid uses for this new kind of camera. The following is my ideal set of criteria that I would like in my EVIL camera. I probably won’t be able to get all of these features but I figure it’s nice to dream about them. 1. Compact – If it isn’t significantly smaller than my DSLR, what is the point. 2. Fast Performance – It doesn’t have to match my DSLR’s speed but it should not be pokey. 3. Great Image Quality – It must match or be very close to my DSLR’s picture quality. 4. High ISO Capability and Quality – It must have decently clean images to at least ISO 3200, preferably better. 5. Good Camera Controls – I would like to use Aperture and Manual modes along with advanced user controls. 6. A Usable Movie Mode – I want a movie mode that will autofocus, quickly and continuously. 7. A Good Selection of Lenses – I would also like some fast primes at least f2.0 or faster. 8. A Good Quality Design – It should be a well made camera with a good industrial design. 9. Image Stabilization in the Body – I can get IS in lens that don’t typically have stabilization such as fast prime lenses. 10. Ability to Use and Focus Canon EF Lens – Probably won’t happen unless Canon creates an EVIL camera. 11. +2, -2 and 0 Exposure Bracketing – Useful when I want to do my HDR photography. More camera companies have jumped into this area but the two big guys, Nikon and Canon have yet to announce any mirror-less cameras. The less popular SLR makers have put their energy into this new class of camera, possibly since its been so challenging to gain any significant market share in the DSLR market. Currently, Panasonic, Olympus, Samsung and Sony have shipped EVIL cameras. Here is a quick run down of the modes. As mentioned above, Olympus and Panasonic have worked together to create the micro four thirds standard. Here are their offerings. Olympus has 3 models. The original E-P1, the slightly updated E-P2 and the lower cost E-PL1. Panasonic has the largest number of models. They shipped the first EVIL camera, the DMC-G1. The DMC-GH1 looks similar but comes with a new kit lens — both the camera and lens is optimized for video. A more compact DMC-GF1 was released that is sized similar to the Olympus cameras. The lower cost DMC-G10 and a new DMC-G2, which replaces the G1, arrived this summer. And finally, the DMC-GH2 is the newer, just released version of the older GH1. All together, Panasonic was released 6 models. Confused yet? Samsung and Sony do not use the micro four thirds standard and use a different and larger image sensor. Samsung offers a pair of cameras. The SLR styled NX10 and the more compact NX100. They use an APS-C size sensor which is larger than the micro four thirds standard. Sony recently released a pair of very similar cameras the NEX-3 and the NEX-5. These cameras also use a larger APS-C similar to Samsung. They also released a new type of camera, the SLT-A33 and SLT-A55, which has a mirror but unlike an SLR it is translucent and does not move. Much of my research usually starts on the web with popular and comprehensive photo test sites such as dpreview.com. These sites are a great place to start and give a nice and consistent overview of the equipment. Its just a starting point however and there is no substitute for actually picking up and playing with the cameras yourself. Based on this initial research, I was able to eliminate the Panasonic and Samsung models. The high ISO performance from both of these manufacturers do not meet my criteria. The first two models from Olympus also had mediocre high ISO performance and have also been removed from consideration. Ironically the low-cost E-PL1 has some outstanding high ISO quality and looks very promising. It looks like the image processing of their newest camera has been significantly improved. The Sony NEX cameras also have very promising image quality. On paper the Olympus has many great features and seems to meet much of my requirements for an EVIL camera. It has great image quality both at low and high ISOs. The body is compact and nicely smaller than my Canon 7D. The kits lens is even collapsible so the camera kit gets even smaller during transport. Another large plus is the in-body image stabilization and decent selection of lens both from Olympus and Panasonic. The Panasonic 20mm f1.7 looks like a wonderful lens and has garnered great reviews. I also know a few photographers with the Olympus and they seem to love them. Kirk Tuck, a local Austin photographer who I respect and admire, also has some great things to say about the E-PL1. The Sony NEX cameras look futuristic and is a definite break with the past. Sony totally re-thought the design of a camera and came up with an innovative design. It’s probably a love it or leave it design since some reviews seem to praise the design while others think it looks strange and unbalanced. Initial reviews praised its image quality but most people hated the user interface. Sony designed the camera for inexperienced people moving up from point and shoot cameras rather than serious and knowledgeable photographers. Luckily a major firmware update has addressed many, but not all the interface criticisms. I also found the Sony SLT translucent mirror cameras very interesting. While they are conventionally styled, they have received high marks for speed and image quality. So based on my initial screening, it looks like the Olympus E-PL1 or the Sony NEX cameras were the most compelling for me. The Sony SLT camera was also in the running. With the target cameras chosen, I went off to the stores to take a look at them in person. I end up visiting several different stores and have looked at the cameras multiple times over a 2 week period. My impressions that I write below are based on playing with the cameras in store, multiple times. I first played with the Sony SLT A55 camera. Its DSLR styled but is very compact — somewhat smaller than the entry-level Canon and Nikon DSLRs. It has a an electronic view finder and interchangeable lenses so while it has a mirror, it qualifies as an EVIL camera. There is a lot going for this camera but ultimately it didn’t feel small enough. It’s conventional SLR shape is still somewhat bulky compared to the 2 other cameras. If I did not already own a DSLR with my investments in Canon lenses, this camera may very well be the camera I would purchase. Next up is the Olympus E-PL1. On paper, I was very enthusiastic about this cameras but in person, less so. The camera is a low-cost version of the original digital PENs and unfortunately it shows. The low-cost re-design has greatly diminished any of the retro-styling that the original EP1 seem to have in spades. What it has is a cluttered design and at times a cheap feel. The knob is small and low-budget. The buttons look like low-grade plastic and the port covers stick out with their mismatched color. I could potentially look past the aesthetic considerations if it weren’t for its performance. I found the focusing speed slow. During focusing, the lens will move in and out slightly before locking in. The focus during movie mode is also very slow and its kit lens is not really designed for video. The LCD was smaller than the now standard 3 inches and the pixel count was low. The LCD view was dim, the pixels were coarse and the user interface was arcane. The fonts and display looked like something from a computer from the previous century. On the plus side, the body was nicely compact with a built-in flash. It has in-body image stabilization and there were enough buttons to be able to quickly change key settings. The Sony NEX camera are the other model that I was seriously considering. I like the modern styling and I prefer it over the nostalgic and retro film camera look. The camera is very minimal on the controls and the user interface can be annoying and slow to use. The cameras I demoed did not have the latest firmware update. The build quality is extremely high and the metal lens barrel and magnesium body on the NEX-5 model (the NEX-3 has a plastic body) has a solid, upscale feel. It almost feels like a modern version of an old solid brass Leica camera. It, of course, looks completely different and weigh less than those older cameras but it has the same precision and quality feel. The focusing was fast for still frames and the movie mode did a decent job of autofocusing, continuously. The LCD was very bright and high-resolution. The interface, as frustrating as it can be was visually very nice. The LCD also tilts up and down which allows the camera to be used more casually like a point and shoot. The lenses for the NEX cameras (there are only 3 at this time) are all designed for video so they focus silently. The lens barrel is larger than the Olympus but the Sony’s body is significantly smaller. The downsides include a non-standard (but included) external flash. It also lacks a hot shoe so you will not be able to add conventional flashes. While the body is small, the lens is large and thus makes for an awkward shape to put in a camera bag. 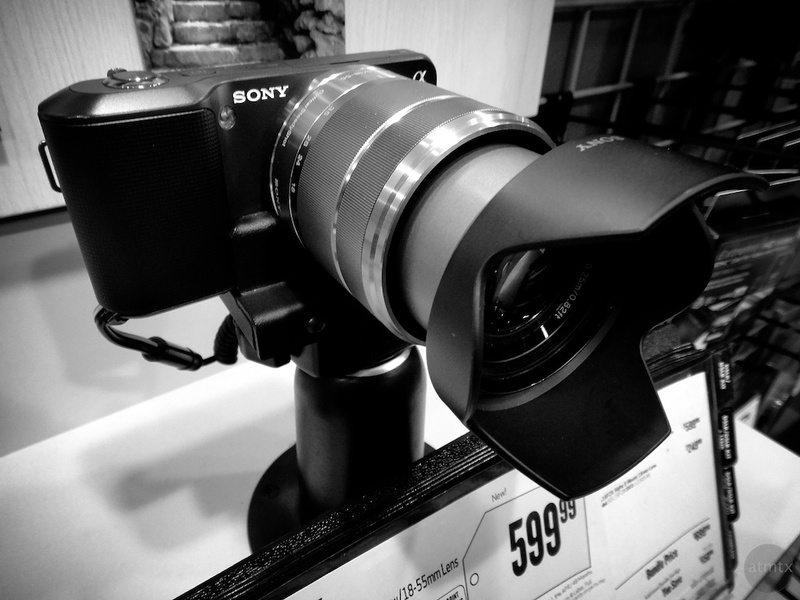 While I’m not quite ready to pull the trigger to buy one of these EVIL cameras, I am very tempted. I also think I have some solid uses for such a camera. Unfortunately, neither the Olympus or Sony have all the features I want. Like most things in life, they both have their advantages and disadvantages. I would also like to test the Sony NEX with the updated firmware. Even despite the current cumbersome user interface, I think the Sony has the lead over the Olympus. I think my situation is a bit different since this camera is going to be secondary to my Canon 7D DSLR. I don’t need the same level of sophistication in my mid-sized camera since I already own a high performance camera. I do however need it to have great picture quality, decent speed, a usable movie mode and a nice overall feel. For someone else looking at an EVIL camera as their one and only camera, the considerations might be very different. Time will tell if I do get one and which one it may ultimately be. I will let you know how it goes. Interesting post Andy. The Olympus looks like fun, but to me, the lens has to be pretty small too or what’s the point? A small camera with a big lens is still a big object that captures attention. I think Canon makes a couple of nice point and shoots that are very compact but still take good photos. I like my Canon dslr for high iso and good dynamic range which I don’t think any of these hybrid cameras can match. If it doesn’t have to be a great image, then point and shoot is ok.
David, great points and thanks for your comments. The best quality Canon point and shoots are the G11 and the S95. As good as they are they are no way as good as the hybrid cameras. In fact, based on my research some of the hybrids are very close to or match the quality of my 7D. I believe you have a 5D with a full frame sensor. This is another class of camera (and sensor) and you are correct, the Hybrids do not match the quality of a 5D or a Nikon D700 or D3. I’d have to agree with David on the comments regarding the lens. Another thing that would personally bug me is not looking through the lens. I’ve gotten to the point with my D5000 that it’s something I use 99.9% of the time and am at a loss when I am given a point-and-shoot to take a snapshot for someone. It seriously affects my composition. Thanks for you comments Joshua. I haven’t decided if I’m going to get one yet, but there is a decent chance that I will, sooner or later. It would really be awesome to have a point and shoot camera with a small lens with DSLR picture quality but unfortunately they don’t exist right now. If you have a large sensor, the lens has to be larger to cover the sensor size, I think. Either way the Olympus E-PL1 or Sony NEX will be significantly smaller and than my 7D. I really like my view finder so I know what you mean. I have been using my Sony TX5 point and shoot with the rear LCD and its been OK. LCD quality has been improving so its been getting better to compose with just the LCD, though they still get washed out in really bright sunlight. I like what I see in the Panasonic GH2. I like the size and shape, I like their AF solution, and their new micro four thirds lenses look very good. But I especially like the video quality in the GH2. Bill, thanks for your feedback. Its great to have an actual user relay their experience. As you know my blog entry was based on my impression at a store, which of course is very different from real life shooting. I’ve read really good things about the Panasonic 20mm. I also just read that the newest Panasonic GH2 is much better low light (high ISO) performance.